Insight SRC and Catholic Education Melbourne support schools to conduct the School Improvement Surveys (SIS) on an annual basis. The results of these surveys identify factors that may contribute to the organisational health of our College and provide valuable information about our future planning and continuous improvement. This week, a group of parents will be invited to participate in the 2018 surveys. This feedback is most important and I encourage you to participate. Wednesday this week was opening night for the Mater Christi College and St Joseph’s College production ofThe Wedding Singer. Tickets are still available, and I urge you to secure your seats as the shows are sure to sell out – http://tickets.burrinja.org.au/. 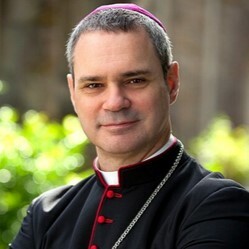 Last Wednesday, I was fortunate to be present for the Liturgical Reception and Solemn Mass for Melbourne’s 9th Archbishop, Peter Comensoli. It was an uplifting event with Archbishop Comensoli declaring his commitment to our community. He concluded proceedings by letting the congregation know that he would be following Essendon (we won’t hold that against him!) now that he has moved to the southern state, having been born in Illawarra. On Saturday, we welcomed next year’s Year 7 students as they worked through a series of assessments as part of the transition program. The boys worked magnificently and, in the breaks, took the time to get to know each other. Enrolment applications for Year 7 2020 close on Friday 17 August 2018. The biennial ‘Time to Shine’ concert was held recently in the State Theatre at the Arts Centre. Pictured (L-R) are Elton Salim (11 Cantamessa), Ms Bronwyn Dean, Sev Dixon (9 O’Sullivan) and Tom Hurley (9 O’Mara). These students had significant roles in this amazing event with audiences of over 2,000 people at each performance. 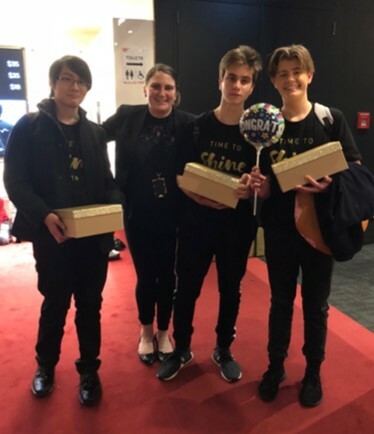 My thanks and appreciation are extended to Ms Dean who encouraged our students to audition and has played an integral role in the rehearsal and staging aspects of ‘Time to Shine’. Students represented the College extremely well at the recent Sunday mass at Our Lady of Lourdes in Bayswater. I appreciate the efforts of all students, staff and parents, especially CJ Preston (10 Prest) and Abel Sujeev (11 Cantamessa), who spoke passionately about their experiences at St Joseph’s College. Father Sebastian celebrated mass and welcomed us to the Bayswater community. Recently we hosted the Reunion of the Class of 1988. Several Old Collegians returned to catch up with former classmates. It was great to welcome the former students back to St Joseph’s College and there was lots of reminiscing over the course of the evening. Tony Di Donato provided them with a tour of the College, bringing back distant memories. 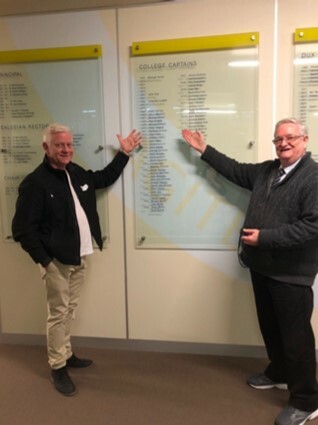 Pictured at the Honour Boards are Fr Jim Acreman, who was Principal in 1988, and the College Captain, Mr Paul English. Preparation for next year’s ACC Swimming is well and truly underway with Mr Patrick van Dyk leading weekly early morning training in the St Joseph’s Indoor Swim Centre. I commend the staff and students who are braving the cold mornings to improve their fitness and skill levels. Matthew Smith (10 Chambers) – Matthew’s father, Dale, died recently. Julian Hochholzer (8 Prest) – Julian’s father, Rene, died recently.